﻿ John 15:2 "Every branch in Me that does not bear fruit, He takes away; and every branch that bears fruit, He prunes it so that it may bear more fruit. Every branch in Me that does not produce fruit He removes, and He prunes every branch that produces fruit so that it will produce more fruit. He cuts off every branch that does not produce fruit in me, and he cuts back every branch that does produce fruit, so that it might produce more fruit. Every branch in me not bearing fruit, he removes it. And every branch that bears fruit, he prunes it, so that it may bear more fruit. Every branch in me that beareth not fruit, he taketh it away: and every branch that beareth fruit, he cleanseth it, that it may bear more fruit. 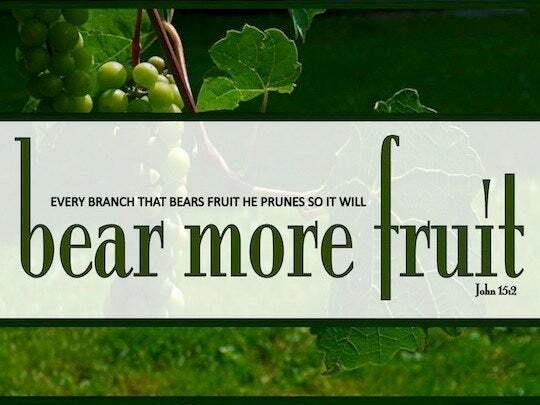 Any branch in Me that does not bear fruit [that stops bearing] He cuts away (trims off, takes away); and He cleanses and repeatedly prunes every branch that continues to bear fruit, to make it bear more and richer and more excellent fruit. He will cut off [See verse 6] every branch [i.e., follower of Christ] who is in [fellowship with] me that does not bear fruit. 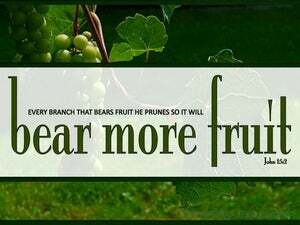 And He will prune every branch that does bear fruit, so it will bear more fruit. Every branch in me that bears no fruit, he takes away; and every branch that bears fruit, he prunes, that it may bear more fruit. He takes away every branch in me which has no fruit, and every branch which has fruit he makes clean, so that it may have more fruit. Every branch in me that bears no fruit he takes away; and every branch that does bear fruit he prunes, so that it may bear more fruit. every branch in me that beareth not fruit, he takes away: as for the branch that bears fruit, he prunes it clean, to make it more fruitful. As to every branch in me not bearing fruit, he takes it away; and as to every one bearing fruit, he purges it that it may bring forth more fruit. Every branch in me not producing fruit, He takes it away: and every one producing fruit, He purifies it, that it may produce more fruit. Any branch of mine that does not bear fruit he trims away, and he prunes every branch that bears fruit, to make it bear more. and every one that beareth fruit, he purifieth it, that it may bear more fruit. Every branch in me that does not bear fruit he shall take away; and every one that bears fruit, he shall purge that they may bring forth more fruit. Every branch in me not bearing fruit he takes away: and every one bearing fruit, he cleanses it, that it might bear more fruit. Every branch in me that bears not fruit he takes away: and every branch that bears fruit, he prunes it, that it may bring forth more fruit. Every branch that does not bear fruit in me, he removes it, and every [branch] that bears fruit, he prunes it in order that it may bear more fruit. Every branch in Me that does not bear fruit, He takes away. And every one that bears fruit, He prunes it so that it may bring forth more fruit. Every branch that beareth not fruit in me, he will take away. And every branch that beareth fruit will he purge, that it may bring more fruit. he cuts away any branch on me which is not bearing fruit, and cleans every branch which does bear fruit, to make it bear richer fruit. "He cuts back any of my branches that bear no fruit, and prunes every fruit-bearing branch, that it may bear more. He takes away every branch that does not bear fruit in me. 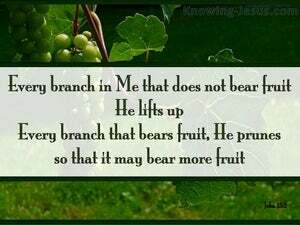 He prunes every branch that bears fruit so that it will bear more fruit. Every branch in me that does not bear fruit, he takes away. Every branch that bears fruit, he prunes, that it may bear more fruit. Every branch in me that beareth not fruit he taketh away; and every branch that beareth fruit he cleanseth, that it may bear more fruit. Every branch in me that bears not fruit he takes away; and every branch that bears fruit he trims, that it may bear more fruit. Every branch in me that beareth not fruit, He taketh it away; and, every one that beareth, fruit, He pruneth it, that, more fruit, it may bear. Every branch in me that beareth no fruit, he taketh it away: and every branch that beareth fruit, he pruneth it clean, that it may bring forth more fruit. Any unfruitful branch in me he takes away, and he cleanses every fruitful branch, that it may bear more fruit. Every branch in me that beareth not fruit, he taketh away; and every branch that beareth fruit, he cleaneth it, that it my bring forth more fruit. Every branch in me--if it bears no fruit, He takes away; and every branch that bears fruit He prunes, that it may bear more fruit. He cuts away any branch on me that stops bearing fruit, and He repeatedly prunes every branch that continues to bear fruit, to make it bear more. Every branch in me that doesn't bear fruit, he takes away. Every branch that bears fruit, he prunes, that it may bear more fruit. Every branch in Me that bears not fruit, He taketh it away: and every one that bears fruit, He cleanseth it, that it may bear more fruit. every branch in me that beareth not fruit He taketh away, and every one that beareth fruit, He purgeth, that it may bear more fruit. 1 "I am the true vine, and My Father is the vinedresser. 2 "Every branch in Me that does not bear fruit, He takes away; and every branch that bears fruit, He prunes it so that it may bear more fruit. 3 "You are already clean because of the word which I have spoken to you. "Nevertheless the righteous will hold to his way, And he who has clean hands will grow stronger and stronger. "For whoever has, to him more shall be given, and he will have an abundance; but whoever does not have, even what he has shall be taken away from him. But He answered and said, "Every plant which My heavenly Father did not plant shall be uprooted. Purify me with hyssop, and I shall be clean; Wash me, and I shall be whiter than snow. The afflicted also will increase their gladness in the LORD, And the needy of mankind will rejoice in the Holy One of Israel. "So let us know, let us press on to know the LORD His going forth is as certain as the dawn; And He will come to us like the rain, Like the spring rain watering the earth." "He will sit as a smelter and purifier of silver, and He will purify the sons of Levi and refine them like gold and silver, so that they may present to the LORD offerings in righteousness. "His winnowing fork is in His hand, and He will thoroughly clear His threshing floor; and He will gather His wheat into the barn, but He will burn up the chaff with unquenchable fire." He spoke another parable to them, "The kingdom of heaven is like leaven, which a woman took and hid in three pecks of flour until it was all leavened." Seeing a lone fig tree by the road, He came to it and found nothing on it except leaves only; and He said to it, "No longer shall there ever be any fruit from you." And at once the fig tree withered. "Those on the rocky soil are those who, when they hear, receive the word with joy; and these have no firm root; they believe for a while, and in time of temptation fall away. "While I was with them, I was keeping them in Your name which You have given Me; and I guarded them and not one of them perished but the son of perdition, so that the Scripture would be fulfilled. who gave Himself for us to redeem us from every lawless deed, and to purify for Himself a people for His own possession, zealous for good deeds. They went out from us, but they were not really of us; for if they had been of us, they would have remained with us; but they went out, so that it would be shown that they all are not of us. 'Those whom I love, I reprove and discipline; therefore be zealous and repent.